We’ve honed a process to apply an agile approach to strategy and planning that helps clients get clarity on their product direction, drives high-value solutions to meet the ever changing needs of their customers, and shifts thinking from an output mindset to an outcome mindset. Before we get into the details let's examine why this is more important than ever for your business. Many methods for building software focus on "building the thing right" (Scrum, Kanban, Extreme Programming etc.) and many other methodologies exists to "build the right thing" (Lean UX, Design Thinking, Lean Startup etc.). When you focus on the former processes and are only looking for efficient output this can be wasteful, even dangerous, for your company. You can easily build a lot of stuff nobody wants. Your goal should always be to build the least amount of software possible to achieve your business objectives; that is true efficiency and why companies need to adopt Lean/Agile ways of taking digital products to market. In the end, we build software to achieve business outcomes. Just as all companies are becoming software companies in turn all companies are also becoming service companies. These two forces create a need for putting the customer first and focusing on outcomes. At Rangle, we like to set the stage for success by using a Lean Discovery process that combines aspects of the latest best practices in the Lean product development ecosystem. A Lean Discovery process begins the shift to an outcome mindset by creating alignment on a vision with an intense focus on the customer's journey and their pain points. 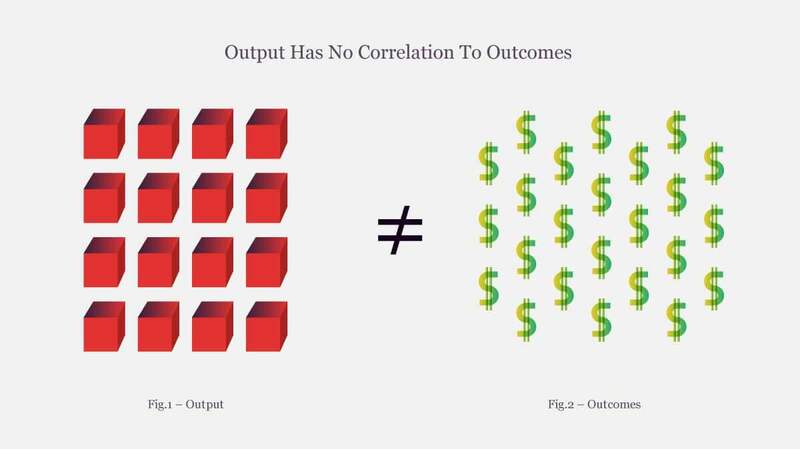 If you want an objective product strategy viewpoint, need to secure a funding round or want to teach your own team how to shift to an outcome mindset, our Lean Discovery process can deliver huge bang for the buck. *NOTE: Because we don't want to get stuck doing a bunch of speculative research, we validate at any point and refine our thinking at each step. Validation with end-users keeps us honest and prevents the team from going too far down the wrong path. 1. Project & Product Goals/Outcomes - What outcomes do you want to see as a result of completing this project? What outcomes do you want to see as a result of launching a successful product? 2. Target Customers/Key Stakeholders - Who are we building this product for? What do they care about? Where can we find them? (Often take the form of customer personas). Who are the key stakeholders we should involve in the process? 3. Customer Journey - What do our key customers do now in order to complete their goals? What are the most painful aspects of this process and how can we start to solve for these points of friction? 4. Project Risks and Assumptions - What assumptions, if proven incorrect, could prevent this project from being successful (a common example is that we don't really know enough about the customer or their journey). The Lean Discovery process is focused on learning and understanding. We really want to make sure that we empathize with the end-users, understand their needs, and map their journey to success in a way that can be easily shared and internalized across the entire project team — and even to upper management. One really effective way to do this is through a Customer Journey Map (sometimes referred to as a User Journey Map). 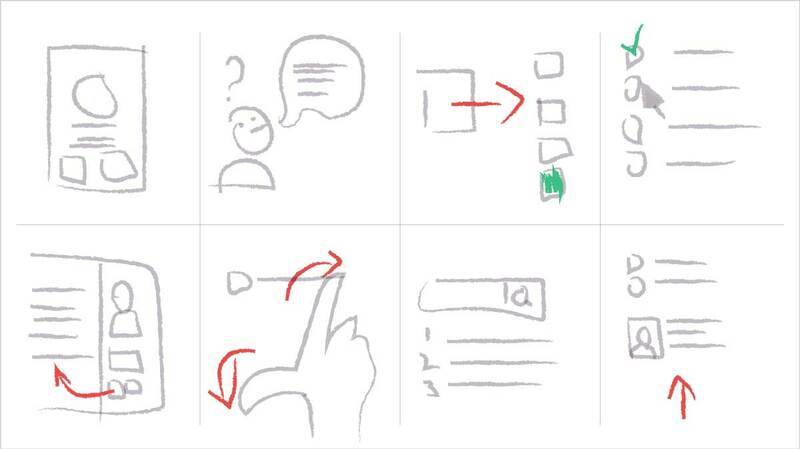 Remember the customer personas and customer’s journey we created in Clarity Canvas? That will form the backbone and beating heart of our Customer Journey Map. It ensures our mindset is always focused on outcomes and is framed by our customer’s end-to-end experience. Stories are powerful tools we can use to easily comprehend and act on complex processes. We use them in a variety of ways with amazing results. This map is crucial because the insights are gleaned from the additive nature of the customer persona and customer journey. 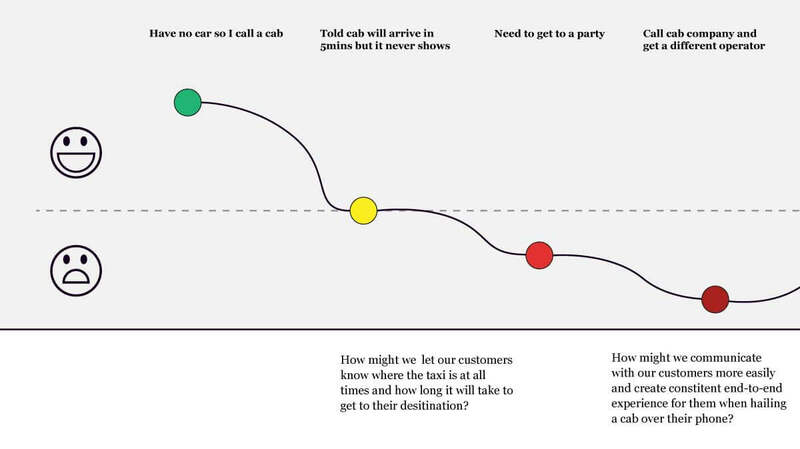 By mapping events in the customer journey to emotional states, we can easily highlight high points of leverage for us to focus on when designing our solution; they are the pain-points in our customers' journey (see the detail below based on an example of how people used to order a taxi not too long ago. You can see there was ample pain in the process which ridesharing companies like Uber just completely took away). Now that we understand our target customer, we’ve mapped their journey and the goals they are looking to accomplish, and have identified and validated key pain-points in that journey, we have the context and insight we need to start creating innovative solutions. This is often referred to as a "Diverge Phase" and it is defined as an exploration of many solutions. Quantity over quality. Some of the activities here include collaborative sketching and ideation. The goal is quantity over quality because someone’s "dumb idea" can spark a brilliant one but we don't want the session to spin away into creative chaos. To combat this, we use time-boxing and structured exercises, like crazy-8s, to keep driving results. Once we align on a solution, the goal is to prototype and test the best one. There are many powerful tools that help us prototype solutions. 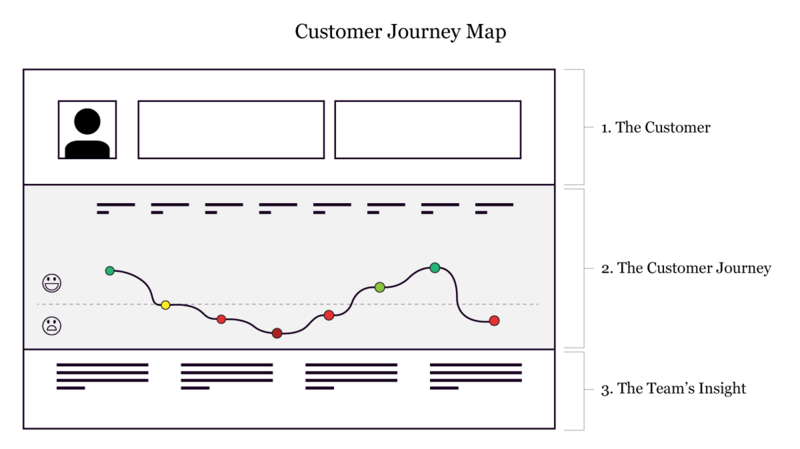 This can take the form of a clickable prototype in something like Invision, a landing page to launch and validate the value proposition or a quick and dirty coded prototype to vet with customers or key stakeholders. Because we start with the customer pain, map the customer’s experience and keep their journey as the central lynchpin to our product strategy we can’t help but focus on outcomes that solve real problems. It’s simple in theory and hard in practice. Deadlines, external and internal pressure, as well as team dynamics can take the focus away from business outcomes at any moment. By visualizing the customer experience and making it plain for all to see we can help maintain focus and regain it even when it is lost. While it can be dangerous to apply generic "Design Thinking" practices to unique problems and feel like you're being innovative, we're familiar with a wide variety of Lean and Agile discovery tools to address your specific needs and project type. Find out more about our design services or contact us to let us know about your project and how we might help. What is a Design System?